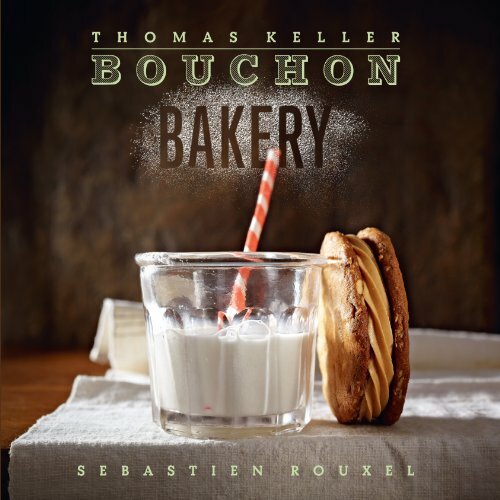 The Cookbook Awards have been formally presented by IACP (International Association of Culinary Professionals) since 1986, when the Tastemaker Awards dissolved its program after 19 years. Under the guidance of cookbook author Bert Greene and the IACP Board of Directors, IACP assumed custody of the awards program that year and has since carried the torch, applauding excellence and setting standards in cookbook publishing now for more than 20 years. A cookbook and wine guide celebrating the traditions of southern Italy, from the country'sforemost regional Italian restaurant. At San Francisco's acclaimed A16 restaurant (named for the highway that cuts across southern Italy), diners pack the house for chef Nate Appleman's house-cured salumi, textbook Naples-style pizzas, and gutsy slow-cooked meat dishes. Wine director Shelley Lindgren is renowned in the business for her expeditionary commitment to handcrafted southern Italian wines. 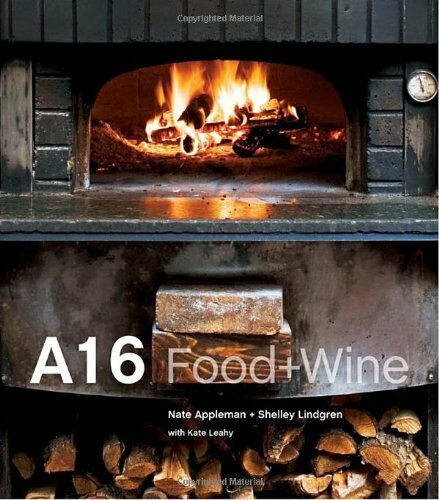 In A16: FOOD + WINE, Appleman and Lindgren share the source of their inspirationthe bold flavors of Campania. From chile-spiked seafood stews and savory roasts to delicate antipasti and vegetable sides, the recipes are beguilingly rustic and approachable. Lindgren's vivid profiles of the key grapes and producers of southern Italy provide vital context for appreciating and pairing the wines. Stunning photography captures the wood-fired ambiance of the restaurant and the Campania countryside it celebrates. When Julia Child told Dorie Greenspan, You write recipes just the way I do, she paid her the ultimate compliment. Julias praise was echoed by the New York Times and the Los Angeles Times, which referred to Dories wonderfully encouraging voice and the sense of a real person who is there to help should you stumble. 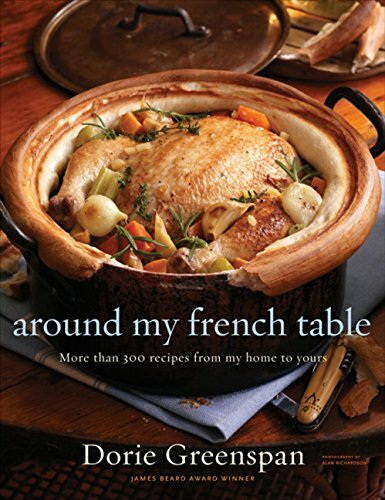 Around My French Table includes many superb renditions of the great classics: a glorious cheese-domed onion soup, a spoon-tender beef daube, and the top-secret chocolate mousse recipe that every good Parisian cook knowsbut wont reveal. Hundreds of other recipes are remarkably easy: a cheese and olive quick bread, a three-star chefs Basque potato tortilla made with a surprise ingredient (potato chips), and an utterly satisfying roast chicken for lazy people. I've got a slideshow of random snapshots that runs as a screensaver on my computer, and every time the picture of pumpkins for sale at Scotts Farm Stand in Essex, Connecticut, comes up, I smile. In the picture, its a sunny day and the pumpkins, scattered higgledy-piggledy across a big field, look like so many roly-poly playthings. Some people might squint and imagine the jack-o-lanterns that many of these pumpkins are destined to become. Me? I see them sitting in the middle of my dining table, their skins burnished from the heat of the oven and their tops mounded with bubbly cheese and cream. Ever since Catherine, a friend of mine in Lyon, France, told me about how she and her family stuff pumpkins with bread and cheese and bacon and garlic and herbs and cream, I cant look at a pumpkin on either side of the Atlantic without thinking, "Dinner!" Of course, pumpkins are a New World vegetable, but Im seeing them more and more in the Paris markets, which means Im making this dish more and more wherever I am. Its less a recipe than an arts and crafts project; less a formula than a template to play with and make your own. Basicallyand its really very basic you hollow out a small pumpkin, just as you would for a jack-o-lantern, salt and pepper the inside, and then start filling it up. My standard recipe, the one Catherine sent to me, involves seasoning chunks of stale bread, tossing them with bacon and garlic, cubes of cheese (when Im in France, I use Gruyere or Emmenthal; when Im in the States, I opt for cheddar) and some herbs, packing the pumpkin with this mix and then pouring in enough cream to moisten it all. But theres nothing to stop you from using leftover cooked rice instead of bread--I did that one night and it was risotto-like and fabulous--or from adding dried fruit and chopped nuts, cooked spinach or Swiss chard, or apples or pears, falls favored fruits. And I was crazy about the dish when I stirred some cooked hot sausage meat into the mix. The possibilities for improvisation dont end with the filling: Youve got a choice about the way to serve this beauty. I think you should always bring it to the table whole--you wouldnt want to deprive your guests of the chance to ooh and aah--but whether you should slice or scoop is up to you. If you serve it in slices, you get a wedge of pumpkin piled high with the filling, and thats pretty dramatic (if something this rustic can be called 'dramatic'). The wedge serving is best eaten with a knife and fork (or knife and spoon). If you scoop, what you do is reach into the pumpkin with a big spoon, scrape the cooked pumpkin meat from the sides of the pumpkin into the center, and stir everything around. Do this and youll have a kind of mash--not so pretty, but so delicious. You might consider serving this alongside the Thanksgiving turkey or even instead of it--omit the bacon and youve got a great vegetarian main course. Center a rack in the oven and preheat the oven to 350 degrees F. Line a baking sheet with a silicone baking mat or parchment, or find a Dutch oven with a diameter thats just a tiny bit larger than your pumpkin. If you bake the pumpkin in a casserole, it will keep its shape, but it might stick to the casserole, so youll have to serve it from the pot which is an appealingly homey way to serve it. If you bake it on a baking sheet, you can present it freestanding, but maneuvering a heavy stuffed pumpkin with a softened shell isnt so easy. However, since I love the way the unencumbered pumpkin looks in the center of the table, Ive always taken my chances with the baked-on-a-sheet method, and so far, Ive been lucky. Using a very sturdy knife--and caution--cut a cap out of the top of the pumpkin (think Halloween jack-o-lantern). Its easiest to work your knife around the top of the pumpkin at a 45-degree angle. 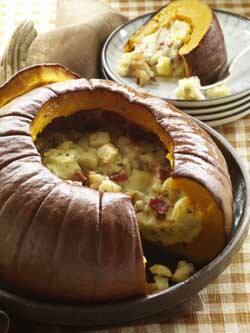 You want to cut off enough of the top to make it easy for you to work inside the pumpkin. Clear away the seeds and strings from the cap and from inside the pumpkin. Season the inside of the pumpkin generously with salt and pepper, and put it on the baking sheet or in the pot. Put the cap in place and bake the pumpkin for about 2 hours--check after 90 minutes--or until everything inside the pumpkin is bubbling and the flesh of the pumpkin is tender enough to be pierced easily with the tip of a knife. Because the pumpkin will have exuded liquid, I like to remove the cap during the last 20 minutes or so, so that the liquid can bake away and the top of the stuffing can brown a little. When the pumpkin is ready, carefully, very carefully--its heavy, hot, and wobbly--bring it to the table or transfer it to a platter that youll bring to the table. Its really best to eat this as soon as its ready. However, if youve got leftovers, you can scoop them out of the pumpkin, mix them up, cover, and chill them; reheat them the next day. I remember once trying to teach a French friend of mine the expression, "as American as apple pie." After Id explained what pie was, I thought the rest would be easy..but not exactly. "I dont understand," she said, "we have apples, too, and we make delicious desserts with them. Why couldnt we say, 'As French as tarte Tatin?'" I certainly wasnt going to argue with her, especially when she was right about all the delicious desserts the French make with apples. One of my favorites is one thats not anywhere near as well known as the upside-down tarte Tatin. Actually, I dont think it has a formal name of any kind. I dubbed it Marie-Helenes Apple Cake because it was my Parisian friend, Marie-Helene Brunet-Lhoste, who first made it for me. Marie-Helene spends her weekends in Normandy, the land of cream, butter, Brie, and apples, and the cake she made had apples shed picked from her backyard that afternoon. I call this dessert a cake, mostly because I dont know what else to call it. The rum-and-vanilla-scented batter is less cakey than custardy. And theres only enough of it to surround the apples. 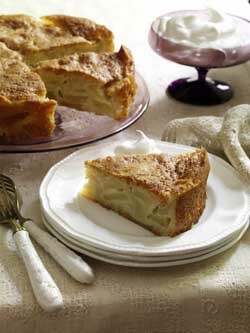 Its a very homey, almost rustic cake and its good no matter what kinds of apples you use. In fact, when I asked Marie-Helene which apples she used, she said she didnt know--she just used whatever she had. The cake is extremely easy to make (foolproof, really, you just whisk the ingredients together in a bowl), satisfying, fragrant (I love the way the house smells when its in the oven) and appealing in an autumn-in-the-country kind of way. Center a rack in the oven and preheat the oven to 350 degrees F. Generously butter an 8-inch springform pan and put it on a baking sheet lined with a silicone baking mat or parchment paper. In a medium bowl, beat the eggs with a whisk until theyre foamy. Pour in the sugar and whisk for a minute or so to blend. Whisk in the rum and vanilla. Whisk in half the flour and when it is incorporated, add half the melted butter, followed by the rest of the flour and the remaining butter, mixing gently after each addition so that you have a smooth, rather thick batter. Switch to a rubber spatula and fold in the apples, turning the fruit so that its coated with batter. Scrape the mix into the pan and poke it around a little with the spatula so that its evenish. Carefully run a blunt knife around the edges of the cake and remove the sides of the springform pan. (Open the springform slowly, and before its fully opened, make sure there arent any apples stuck to it.) 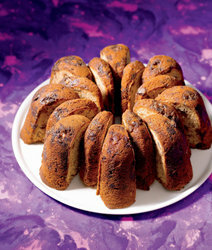 Allow the cake to cool until it is just slightly warm or at room temperature. If you want to remove the cake from the bottom of the springform pan, wait until the cake is almost cooled, then run a long spatula between the cake and the pan, cover the top of the cake with a piece of parchment or wax paper, and invert it onto a rack. 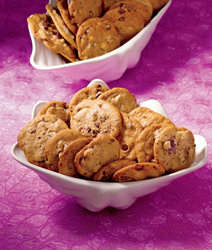 Carefully remove the bottom of the pan and turn the cake over onto a serving dish. The cake can be served warm or at room temperature, with or without a little softly whipped, barely sweetened heavy cream or a spoonful of ice cream. Marie-Helene served her cake with cinnamon ice cream and it was a terrific combination. The cake will keep for about 2 days at room temperature and, according to my husband, gets more comforting with each passing day. However long you keep the cake, its best not to cover it its too moist. Leave the cake on its plate and just press a piece of plastic wrap or wax paper against the cut surfaces. Bistro cookingbold and full-flavoredis more like the best home cooking than restaurant fare, featuring slow-cooked stews, exquisitely roasted chickens, perfectly seared steaks, vibrant salads, fresh fruit tarts, and comforting custards. 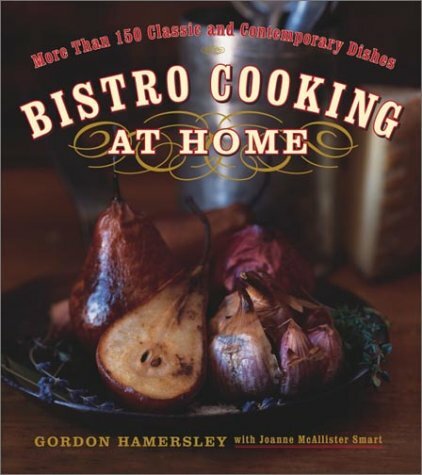 Now Gordon Hamersley of acclaimed Hamersleys Bistro in Boston helps home cooks bring these classic dishes into their own kitchens. Bistro Cooking at Home offers a complete menu of versatile selections for cooks who crave sophisticated but easy-to-prepare comfort food. Many of the dishes allow for walk-away cooking, such as stews, roasts, or braises. And many of these same dishes taste best if prepared a day or two ahead, making entertaining foolproof. Although the accent is French, dishes such as hamburgers stuffed with blue cheese and Pear Cranberry Crumble reflect Gordon Hamersleys all-American roots. Start a bistro meal at home with Hamersleys classic Onion Soup au Gratin or signature Wild Mushroom and Roasted Garlic Sandwich. For a main course there is roast chicken (you can cook it ahead and reheat it under the broiler), New England Bouillabaisse with Rouille and Croutons, or Moroccan lamb shanks. Pasta, polenta, and risotto are given French finesse in dishes such as Lemon-Scented Risotto with Morels and Chives and Oven-Baked Penne with Onions, Walnuts, and Goat Cheese. The Savory Tarts, Gratins, and Galettes chapter holds such richly satisfying dishes as Portobello Mushroom and Roquefort Galette or Creamy Bistro Potato and Leek Gratin, each practically a meal in itself. Even vegetables are made exciting in dishes ranging from Roasted Artichokes with Garlic and Pancetta Bread Crumbs to Garlicky Mashed Potato Cakes. Bistro-inspired desserts include Maple Creme Brulee, Profiteroles with Easy Chocolate Sauce, and a dense Chocolate Truffle Cake. All the main dishes are accompanied by knowledgeable, down-to-earth wine recommendations from Fiona Hamersley, Gordons wife, who runs the wine service at the restaurant. With the Hamersleyss expert guidance every step of the way, you can re-create the romance of bistro diningat home. A personal invitation into the kitchen of one of Canadas most popular cookbook authors. 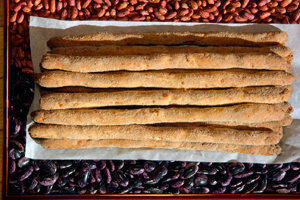 For Bonnie Stern, good food is an essential element in turning a house into a home. With this lavish new cookbook, Bonnie invites us into her kitchen as she prepares food for the people she loves. 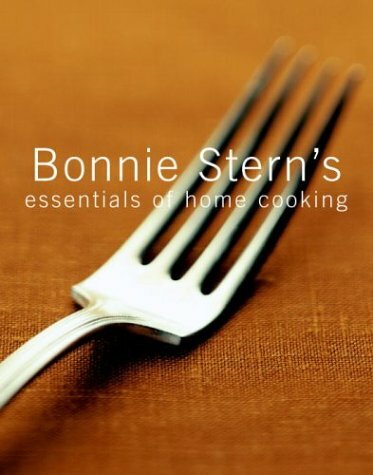 Bonnie Sterns Essentials of Home Cooking is filled with Bonnies personal favourites -- dishes that reflect the way we are cooking now. Youll find wonderful new recipes such as Caramelized Onion Tart with Gorgonzola, Lemon Meringue Pavlova Roll and Thai Shrimp Dumplings with Orange Chili Sauce. 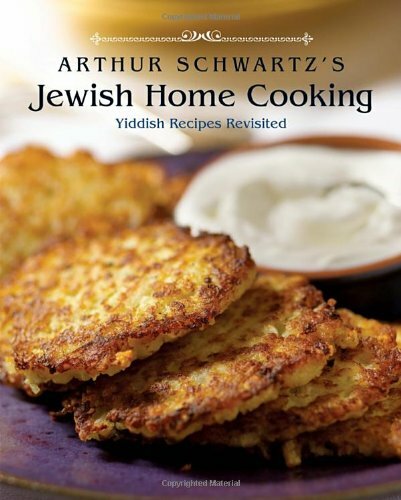 The book also includes some of Bonnies most popular dishes, such as Wheat Berry and Grilled Corn Salad, Split Pea Soup with Dill and Old-fashioned Rice Pudding, as well as time-honoured classics like Prime Rib of Beef with Yorkshire Pudding and Double Fudge Chocolate Cake. The recipes are fresh and full of flavour but never difficult to prepare, and Bonnies trademark step-by-step method and reassuring guidance will help even the most nervous cook through techniques like making meringues, working with phyllo and cooking the perfect risotto. Along with the delicious recipes and striking photographs, Bonnie provides her own insights on topics she considers important to home cooking, from choosing organic produce to preparing light meals and cooking for children. 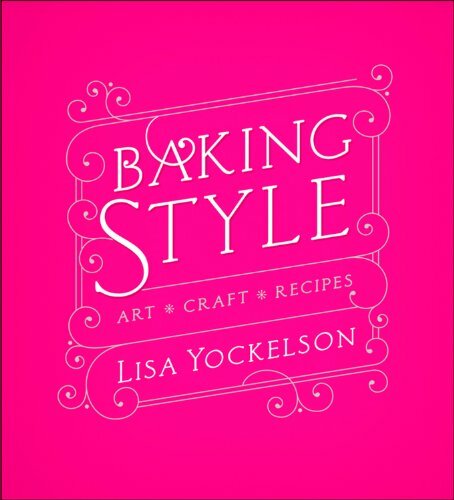 And the text is full of funny and down-to-earth anecdotes gleaned from her extensive travels, her latest restaurant finds and her many years of teaching and working with some of the worlds best chefs. This beautiful book is a must-have for anyone who loves good food, and for Bonnie Stern fans everywhere. An eye-opening look at aquaculture that does for seafood what Fast Food Nation did for beef. Dividing his sensibilities between Epicureanism and ethics, Taras Grescoe set out on a nine-month, worldwide search for a deliciousand humaneplate of seafood. What he discovered shocked him. From North American Red Lobsters to fish farms and research centers in China, Bottomfeeder takes readers on an illuminating tour through the $55-billion-dollar-a-year seafood industry. Grescoe examines how out-of-control pollution, unregulated fishing practices, and climate change affect what ends up on our plate. 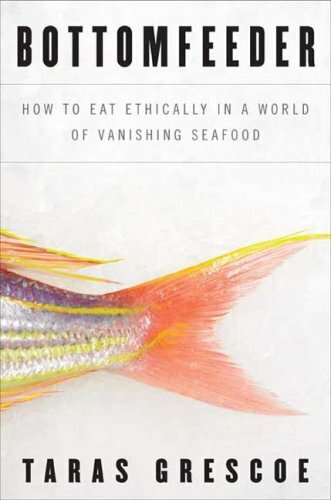 More than a screed against a multibillion-dollar industry, however, this is also a balanced and practical guide to eating, as Grescoe explains to readers which fish are best for our environment, our seas, and our bodies. At once entertaining and illuminating, Bottomfeeder is a thoroughly enjoyable look at the world's cuisines and an examination of the fishing and farming practices we too easily take for granted. 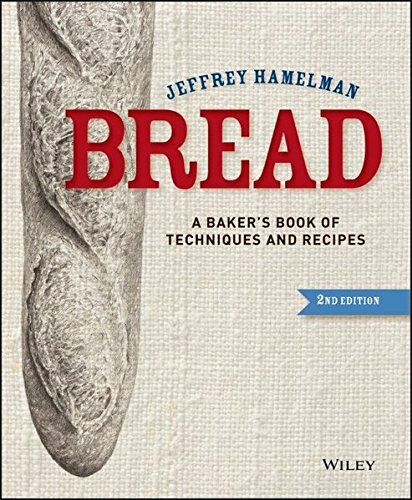 Hailed as a "revelation" when it first appeared in 2004, Jeffrey Hamelman's Bread is a legendary resource praised by baking luminaries from around the world. 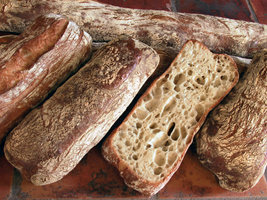 Explaining complex techniques with simple and helpful illustrations, the book includes recipes for a vast array of breads, including sourdoughs, brioche, authentic rye breads, flat breads, French breads, and much more. 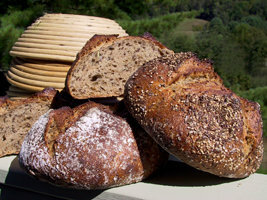 Whether you're an aspiring or practicing professional baker or a dedicated home hobbyist, Bread is the ultimate resource for almost any variety of bread you can imagine. Naomi Duguids heralded cookbooks have always transcended the category to become something larger and more important (Los Angeles Times). Each in its own way is a breakthrough book . . . a major contribution (The New York Times). 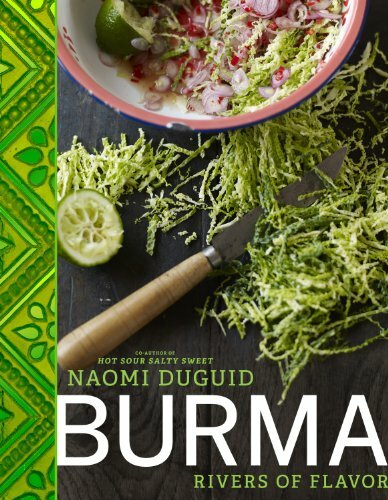 And as Burma opens up after a half century of seclusion, who better than Duguidthe esteemed author ofHot Sour Salty Sweetto introduce the country and its food and flavors to the West. Salads are one of the best entry points into the glories of this cuisine, with sparkling flavorscrispy fried shallots, a squeeze of fresh lime juice, a dash of garlic oil, a pinch of turmeric, some crunchy roast peanutsbalanced with a light hand. The salad tradition is flexible; Burmese cooks transform all kinds of foods into salads, from chicken and roasted eggplant to spinach and tomato.And the enticing Tea-Leaf Salad is a signature dish in central Burma and in the eastern hills that are home to the Shan people. Tasty sauces, chutneys, and relishesessential elements of Burmese cuisinewill become mainstays in your kitchen, as will a chicken roasted with potatoes, turmeric, and lemongrass; a seafood noodle stir-fry with shrimp and mussels; Shankhaut swei, an astonishing noodle dish made with pea tendrils and pork; a hearty chicken-rice soup seasoned with ginger and soy sauce; and a breathtakingly simple dessert composed of just sticky rice, coconut, and palm sugar. Interspersed throughout the 125 recipes are intriguing tales from the authors many trips to this fascinating but little-known land. One such captivating essay shows how Burmese women adorn themselves withthanaka,a white paste used to protect and decorate the skin. Buddhism is a central fact of Burmese life: we meet barefoot monks on their morning quest for alms, as well as nuns with shaved heads; and Duguid takes us on tours of Shwedagon, the amazingly grand temple complex on a hill in Rangoon, the former capital. She takes boats up Burmas huge rivers, highways to places inaccessible by road; spends time in village markets and home kitchens; and takes us to the farthest reaches of the country, along the way introducing us to the fascinating people she encounters on her travels. The best way to learn about an unfamiliar culture is through its food, and inBurma: Rivers of Flavor,readerswill be transfixed by the splendors of an ancient and wonderful country, untouched by the outside world for generations, whose simple recipes delight and satisfy and whose people are among the most gracious on earth. 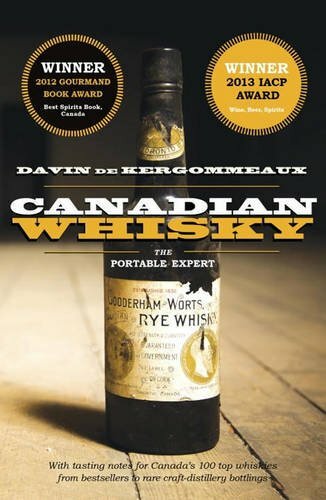 In this Gourmand Book Award- and IACP Award-winning book, Davin de Kergommeaux takes readers on a journey through the first systematic presentation of Canadian whisky: how it's made, who makes it, why it tastes the way it does, its history, and the rich, centuries-old folklore surrounding it. Join whisky authority Davin de Kergommeaux on a pan-Canadian journey from British Columbia to Nova Scotia, celebrating the diversity of Canada's unique spirit. With his conversational and accessible tutelage, de Kergommeaux offers readers a carefully researched, reliable, and authoritative guide to Canadian whisky that is, quite simply, not available anywhere else. Not only a book describing the history and culture of the spirit, Canadian Whisky: The Portable Expert is also an informed exploration of taste. For the first time, whisky consumers -- experts and novices alike -- can approach Canadian whisky with a connoisseur's appreciation of its rich subtleties. 2011 Winner, International Association of Culinary Professionals Jane Grigson Award2011 Finalist, International Association of Culinary Professionals in the Culinary History categoryThroughout history, people have had a complex and confusing relationship with mushrooms. Are fungi food or medicine, beneficial decomposers or deadly "toadstools" ready to kill anyone foolhardy enough to eat them? In fact, there is truth in all these statements. 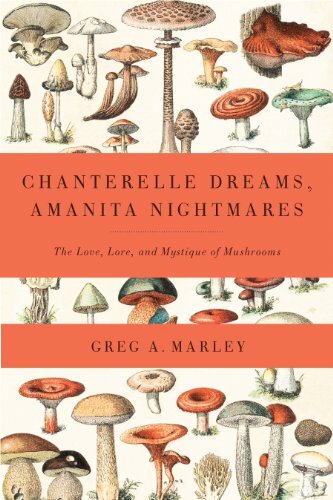 In Chanterelle Dreams, Amanita Nightmares, author Greg Marley reveals some of the wonders and mysteries of mushrooms, and our conflicting human reactions to them. With tales from around the world, Marley, a seasoned mushroom expert, explains that some cultures are mycophilic (mushroom-loving), like those of Russia and Eastern Europe, while others are intensely mycophobic (mushroom-fearing), including, the US. He shares stories from China, Japan, and Korea-where mushrooms are interwoven into the fabric of daily life as food, medicine, fable, and folklore-and from Slavic countries where whole families leave villages and cities during rainy periods of the late summer and fall and traipse into the forests for mushroom-collecting excursions. From the famous Amanita phalloides (aka "the Death Cap"), reputed killer of Emperor Claudius in the first century AD, to the beloved chanterelle (cantharellus cibarius) known by at least eighty-nine different common names in almost twenty-five languages, Chanterelle Dreams, Amanita Nightmares explores the ways that mushrooms have shaped societies all over the globe. This fascinating and fresh look at mushrooms-their natural history, their uses and abuses, their pleasures and dangers-is a splendid introduction to both fungi themselves and to our human fascination with them. From useful descriptions of the most foolproof edible species to revealing stories about hallucinogenic or poisonous, yet often beautiful, fungi, Marley's long and passionate experience will inform and inspire readers with the stories of these dark and mysterious denizens of our forest floor. Chef David Waltuck calls Chanterelle "a fantasy of a restaurant, dreamed up by a little, food-loving kid, that somehow, magically, came true." For over 28 years and from two different New York City locations, Chanterelle has broken the boundaries of French cooking, winning over such fans as Gael Greene, Richard Avedon, Keith Haring, and Malcolm Forbes along the way. 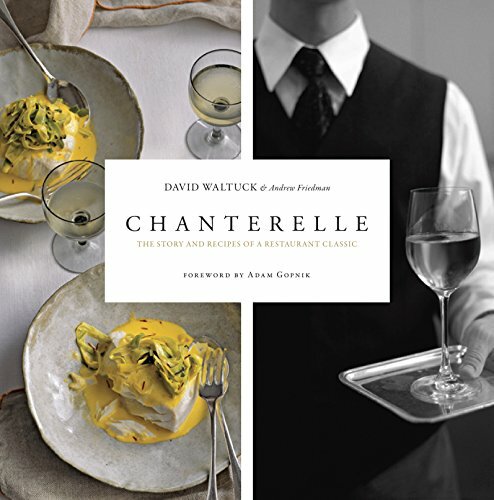 Now, co-owner and co-founder Waltuck invites you into his bustling kitchen with a sumptuously illustrated cookbook chock-full of the recipes that have made Chanterelle a destination restaurant of international stature. From their signature Seafood Sausage and other fish and shellfish creations to salads and first courses, poultry and rabbit, meat and game, side dishes, and desserts, the book simply overflows with nouvelle cuisine classics. A must for anyone who has ever had the pleasure of dining there -- and perfect for professionals and the armchair market -- "Chanterelle "is a cookbook to savor. 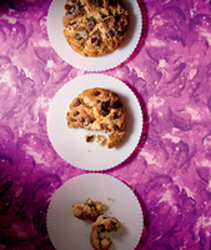 In this scintillating narrative, acclaimed foodie Mort Rosenblum delves into the complex world of chocolate. From the mole poblano (chile-laced chicken with chocolate) of ancient Mexico to the contemporary French chocolatiers who produce the palets d'or (bite-sized, gold-flecked bricks of dark chocolate) to the vast empires of Hershey, Godiva, and Valrhona, Rosenblum follows the chocolate trail the world over. He visits cacao plantations; meets with growers, buyers, makers, and tasters; and investigates the dark side of the chocolate trade as well as the enduring appeal of its product. 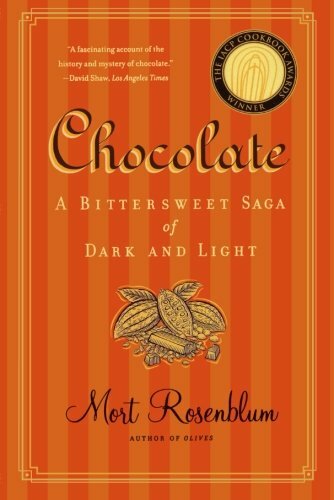 Engaging, entertaining, and revealing, Chocolate: A Bittersweet Saga of Dark and Light is an intriguing foray into this "food of the gods." The West Country is justly famous for its wide variety of delicious ciders. Over the last thirty years there has been a quiet revolution in the area with a steady growth in cider producers, from small, local companies to well-established outfits pumping out millions of gallons a year. 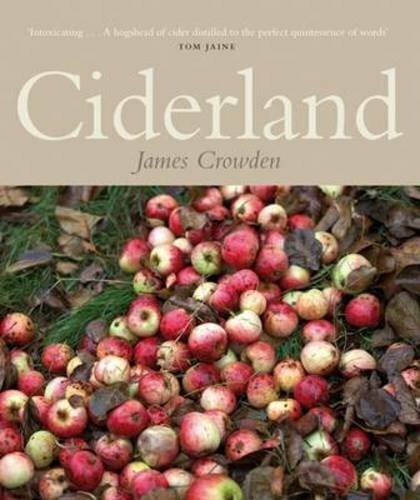 In this book, James Crowden charts the development of cider making in the West Country, from the sixteenth century monks to the diverse industry of today. Crowden takes us on a tour around the beautiful and fragrant West Country orchards, outlining the differing manufacturing methods, and investigates the differences between a farm-house cider and an industrially manufactured one. He shows how the best cider makers translate their passion into the process and treat each different batch of cider like winemakers would a vintage. He also takes a look at the rise of perry making and profiles the companies dedicated to getting the best out of the West Country pears. Ciderland includes comprehensive summaries and descriptions of every cider and cider producer in the West Country and covers topics such as cider folk traditions and remedies, placing cider making firmly within the local culture. 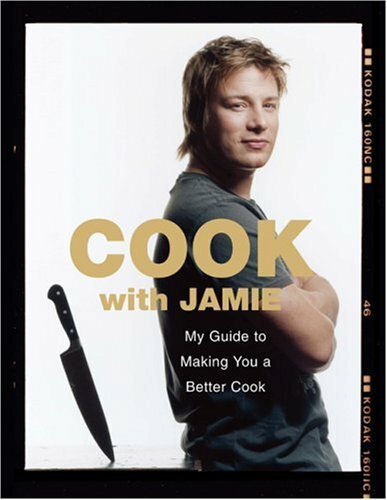 My guide to making you a better cook. I can't tell you how long I've dreamed about writing this book. It's the biggest book I've ever done, and I've really tried to make it a timeless, modern-day classic. Whether you're a student, a young couple, an established cook, or a novice, I'll take you through a whole load of simple and accessible recipes that will blow the socks off your family and any guests you might have round for dinner. There's information on the equipment that I think you should have in your kitchen, advice on how to recognize and cook loads of different cuts of meat, as well as on how to get the best value and quality when you're out shopping. With all of us consuming more processed food than ever, it's a sad fact that most people just aren't confident enough to cook anymore. With this in mind, now is the time for you to get stuck in and reclaim your fantastic cooking heritage! You know what . . . if you're going to eat three times a day for the rest of your life, you might as well learn to cook properly and enjoy it! So roll up your sleeves and let me help you. P.S. : By the way, you should feel good about buying this book because every single penny I make from it will go toward training and inspiring young kids from tough backgrounds all over the world to have a career in food through the Fifteen Foundation. So on behalf of them, thank you.